Upon checking the mail this afternoon, I found a copy of the 2012-2013 BCS Media Guide in my mail box. The media guide was mailed to me in a Big East Conference envelope. So, as always, I wanted to say thanks to both the BCS and the Big East Conference. 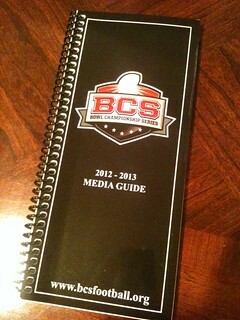 Thanks to the BCS for sending out a copy of their media guide and thanks to the Big East for picking up the shipping. This entry was posted in 2012, Media Guide by Travis Normand. Bookmark the permalink.